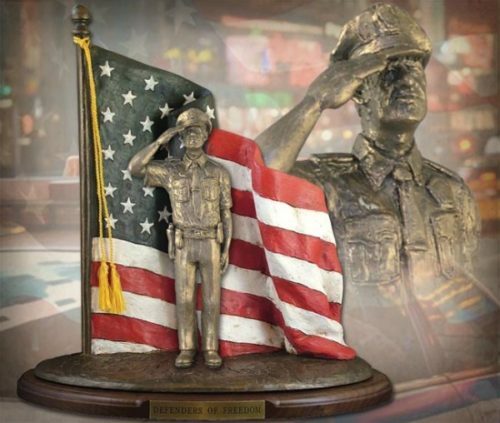 Inspired by his local community of law enforcement officers, Defenders of Freedom: Thin Blue Line honors Michael Garman’s newest handmade Law Enforcement Hero. Defenders of Freedom is made to order. Please allow up to 3 weeks for delivery. Call or email us to discuss all the ways you can personalize this sculpture. Call 800-731-3908 or email artwork@michaelgarman.com. Sculpture measures 14.75″ x 14.5″ x 7″. ©2016. Bronzetone finish. #MG1136. 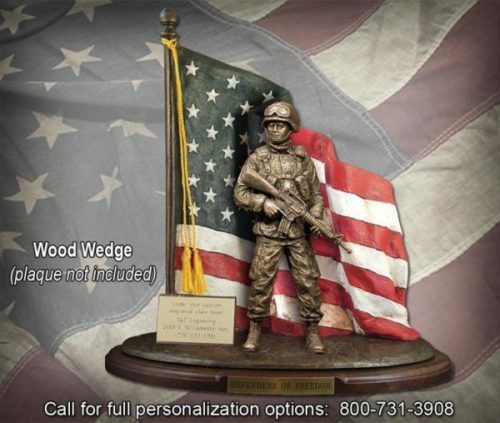 Includes wood base and “Defenders of Freedom” engraved plaque. Upgrade your sculpture with an Upright Wood Wedge – plaque not included.